Western blot analysis of whole cell lysates probed with APEX1 antibody followed by detection with Goat anti Rabbit HRP conjugated (1/10,000, STAR208P) and visualized on the ChemiDoc MP with 34 second exposure. Arrow points to APEX1 (molecular weight 34 kDa). APEX1 antibody recognizes apurinic/apyrimidinic endodeoxyribonuclease 1 also known as AP endonuclease class I, AP lyase, deoxyribonuclase, protein REF-1 or redox factor-1 . Rabbit anti Human APEX1 antibody recognizes apurinic/apyrimidinic endodeoxyribonuclease 1 also known as AP endonuclease class I, AP lyase, deoxyribonuclase, protein REF-1 or redox factor-1 . Apurinic/apyrimidinic (AP) sites occur frequently in DNA molecules by spontaneous hydrolysis, by DNA damaging agents or by DNA glycosylases that remove specific abnormal bases. AP sites are pre-mutagenic lesions that can prevent normal DNA replication so the cell contains systems to identify and repair such sites. Class II AP endonucleases cleave the phosphodiester backbone 5' to the AP site. This gene encodes the major AP endonuclease in human cells. Splice variants have been found for this gene; all encode the same protein (provided by RefSeq, Jul 2008). 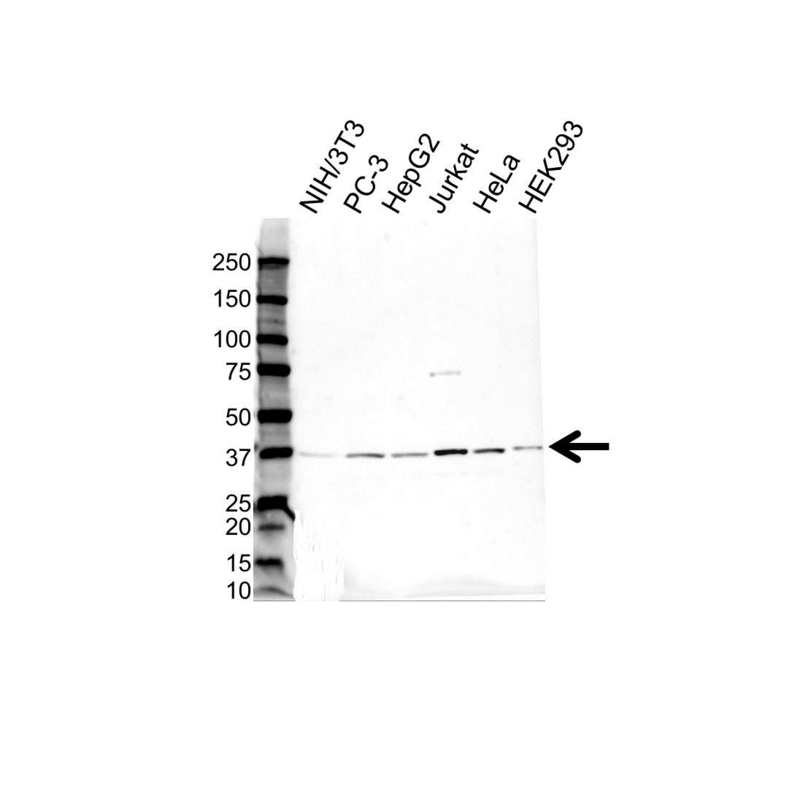 Rabbit anti Human APEX1 antibody detects a band of 34 kDa. The antibody has been extensively validated for western blotting using whole cell lysates.